At Snappy Kitchens, we provide a process with personality. While it is efficient and effective, it is not without guidance and discussion. You have ideas and we have expertise to share. Our people are creative and passionate about bringing your custom kitchen’s vision to life. It is the perfect blend of function and imagination – a relationship that produces beautiful results. 1. We’ll validate your measurements, discuss any custom design needs or wants, provide alternatives to fit style and budget if needed, and reflect on the overall palette and its cohesiveness with the rest of your home. 2. 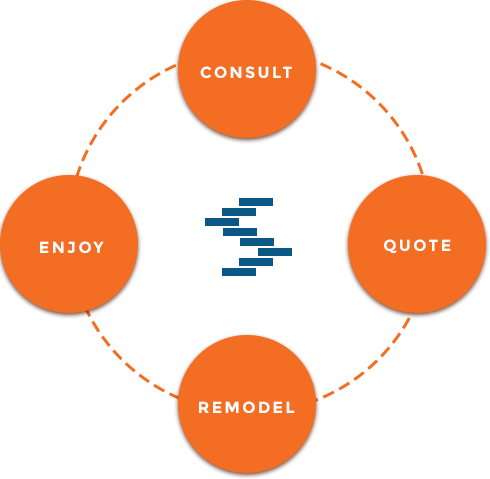 We’ll provide a detailed quote with an exact cost based on the scope of your custom kitchen remodel, confirmed measurements, and your final selections for materials. 3. We’ll prepare a project timeline showing the sequence of work to be performed – and get started on your project. 4. Wow! Get ready to enjoy your beautiful new custom kitchen – it’s complete!